I’m not sure if this is the exact name my Aunt Denise uses for her bell pepper/cilantro/black eyed pea salsa-esque dish that’s always been such a hit but if it is, boy, that woman can sure make a mean Texas Caviar. Once everything is chopped place in a large bowl and season with salt and pepper. Dress the veggies with the oil, vinegar and finely chopped garlic. Add the cilantro and hot sauce and toss well to combine. Refrigerate for at least 3-4 hours to allow the flavors to meld. It’s such a fun dish – it looks a bit like confetti doesn’t it!? Enjoy it over greens or grab a bag of chips and dig in, you can’t go wrong! And Aunt Denise, if you’re reading this, I’m looking forward to hearing how this compares with your recipe! 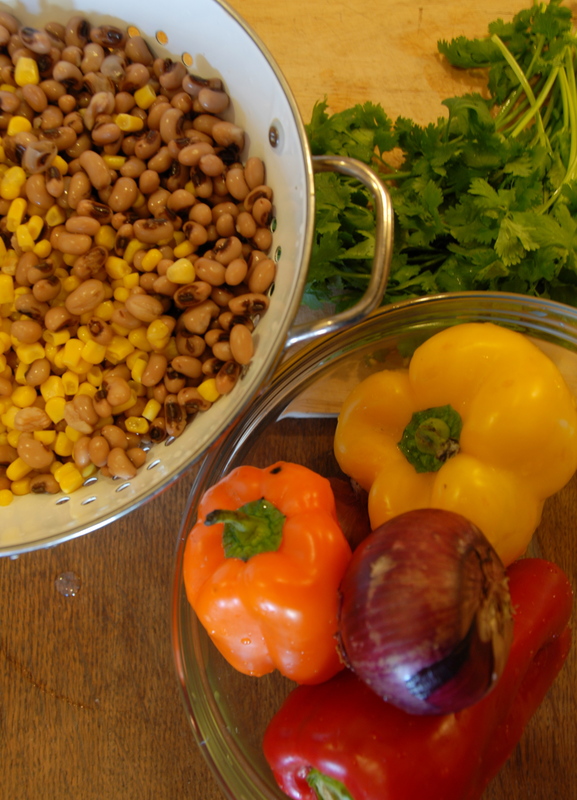 This entry was posted in Bell Peppers, Corn, Garlic, Onions and tagged black eyed peas, corn, easy, garlic, peppers, red onion, salad, salsa. Bookmark the permalink. my mom gave me a recipe almost exactly similar to this that i make a lot in the summer. only difference is mango instead of bell peppers, and then also some avocado. yum.